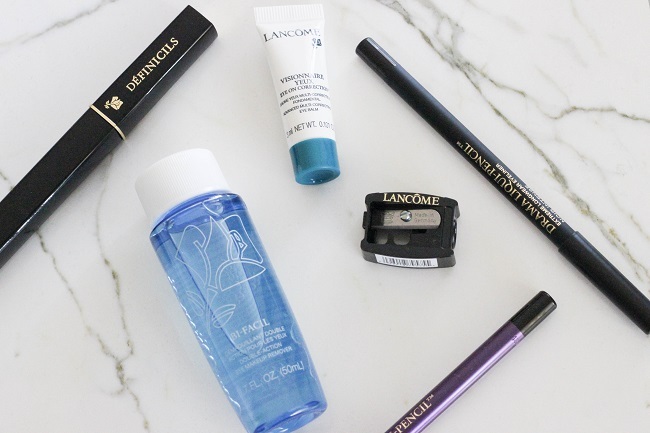 Eye makeup has always been my thing so I was excited when I got the email that I was qualified for the Lancome voxbox from Influenster. I'm the type of person that can't leave the house without some mascara and eyeliner on so this was perfect! 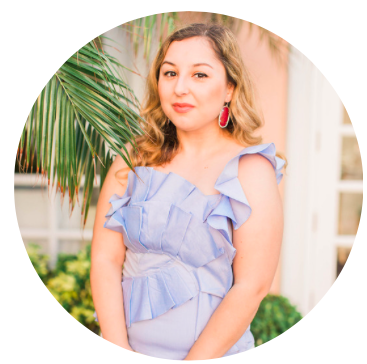 If you're interested in receiving free makeup or other products from Influenster, make sure to sign up and connect your Facebook account to get started! There was tons of products in this voxbox which includes the Defincils Mascara in Black, not one but two Drama Liqui-Pencils in the shades Black and Ampoule, Bi-Facil Double Action Makeup Remover (which I already have but it's always nice to have more! 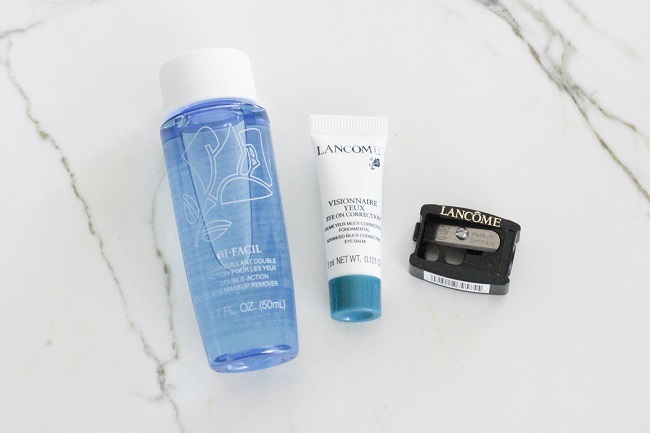 ), Visionnaire Yeux Multi-Correcting Eye Balm (similar to a primer), and a eye pencil sharpener. 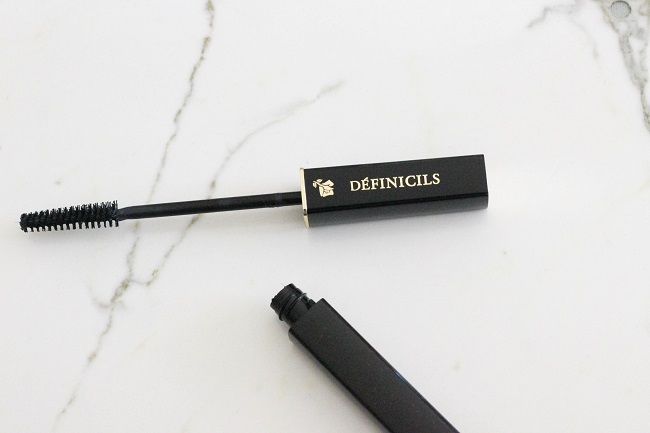 First up is the Defincils Mascara which I remember my Mom using when I was growing up and would play with her makeup all the time haha #thegoodolddays. The brush is quite narrow and thin compared to other mascaras that I use and while it does lengthen my lashes significantly, I prefer mascara that gives me big, volumnious lashes and this just didn't do it for me. Although I will say having a narrow brush makes it easy to coat every single lash, even the tiny ones on the corners of your eyes! As for the Drama-Liqui eye pencils, I had a much better experience and loved how they went on so smoothly! Seriously, you don't have to put any pressure on them because they just glide on and actually stay on your lids for a long time. 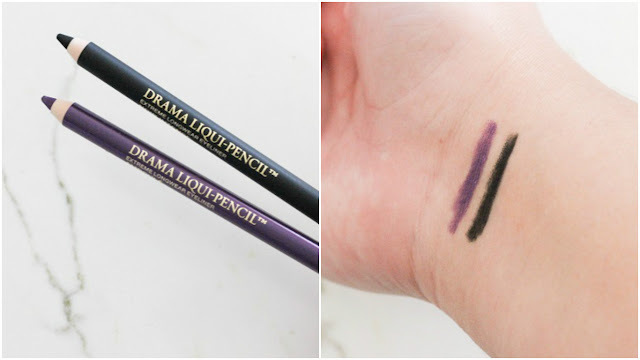 I adored the Ampoule shade which is a metallic purple (the shimmer is very subtle but gorgeous!) and looks gorgeous on brown or green eyes. So glad they included these in the voxbox! Next is the Visionnaire Yeux Multi-Correcting Eye Balm which I thought was pretty pointless since it's a mini-sample size and didn't do much for my eyes. It's an eye balm which claims to act as a primer and helps to minimize imperfections on your eye lids. Eh. It didn't make a big difference when it comes to how long my eye makeup lasted and I could go without it but then again I have dry skin so this might work better for someone with oily lids. Lastly, the Bi-Facil Double Action Makeup Remover which as I mentioned earlier, I already own and it's my go-to when I need to remove heavy eye-makeup. How heavy you ask? When I'm wearing layers and layers of eyeshadow, liquid eyeliner, and tons of mascara for a night out and want something that's going to get rid of every trace of it before I go to bed. Whenever I use this stuff, I never wake up in the morning with traces of makeup around my eyes. It's THAT good. What do you think about Lancome? Any products that you would recommend? Let me know in the comments below!